Wrap up your bedroom and render a vibrant look with these brightly coloured bedsheet sets and bed covers that come in a variety of colors like yellow, green, blue and red. They are available in both single and double bed sizes. Woven out of premium fabric, these bedsheets are unique in design and print. Be it kids or adults, all are bound to find comfort in these soft-textured bedsheets. They come along with matching pillow and cushion covers that add to the elegance of the overall look. Also, explore dohars, blankets, duvet covers, chair pads, table runners, table mats and napkins online at Urbanladder. Home linen requires careful choosing and selection before you decide to buy. They are not just meant to be spread on beds and mattresses but also speak of your taste and define the overall look of the living room or bedroom. Apart from looks, what matters is the fabric they are woven out of as they come in direct contact with you while you rest on them. So, it is important that they are skin-friendly and do not harm in any way. Moreover, they require careful laundering as you would not want them to fade or lose their lustre and texture after a wash or two. So, here at Urban Ladder, we keep a note of all these points and give your worries a flight with choicest cotton bedsheet sets and covers available in various bright colours. They immediately make you feel home and gel with the décor of your living room or bedroom as per your selection of colour and design. They are unique in terms of print quality and patterns that are hard to be found elsewhere in the same competitive price they are tagged at. Club these bedhseets with duvet covers available in equally bright colors and designs like stripes, motifs etc., and also available in both single and double bed sizes. 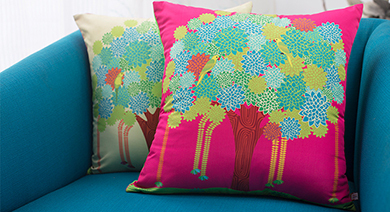 They can be decked up with cushions wrapped in some artistic cushion covers available with us. They come in various sizes and prints like abstract prints from nature, floral prints, motifs etc. Not only bedsets, we also offer dohars, quilts and blankets in bright colors like yellow, pink and blue. Available in both single and double bed sizes, they come in some sober prints and designs. Got some furniture that need to be cushioned up? We bring you chair pads and cushions available in sets of 2 and 6 in orange, green and wheat brown colors. They are washable and soft and would easily fit onto your chairs, sofas or even used as mattresses for sitting on the floor as you like it. We have got something for your table sets too. These are table runners in varying sizes as per your need and suitability. They come in various colours with floral or geometrical patterns. These runners can be easily wiped clean without the hassle of removing dirty stains from your furniture. Club them with matching table mats and napkins for your happy meal hours that keep your furniture as well as clothes stain-protected. They come in sets of 6, so a larger dining room can be covered with 2 sets of same pattern available with us.